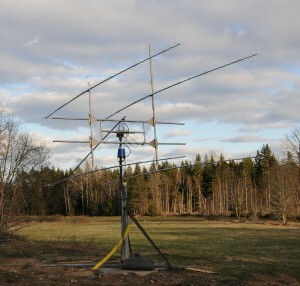 Temporary 70cm EME operation, by SM7SJR in 2010. 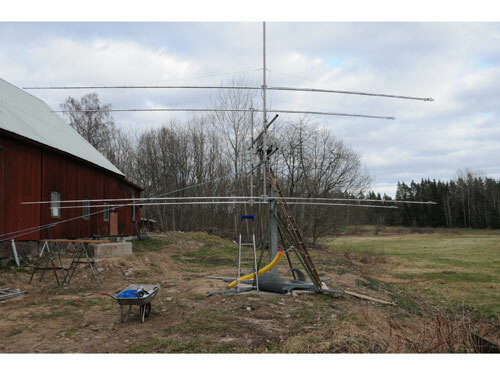 I wanted to work the KP4AO expedition on 70cm EME. 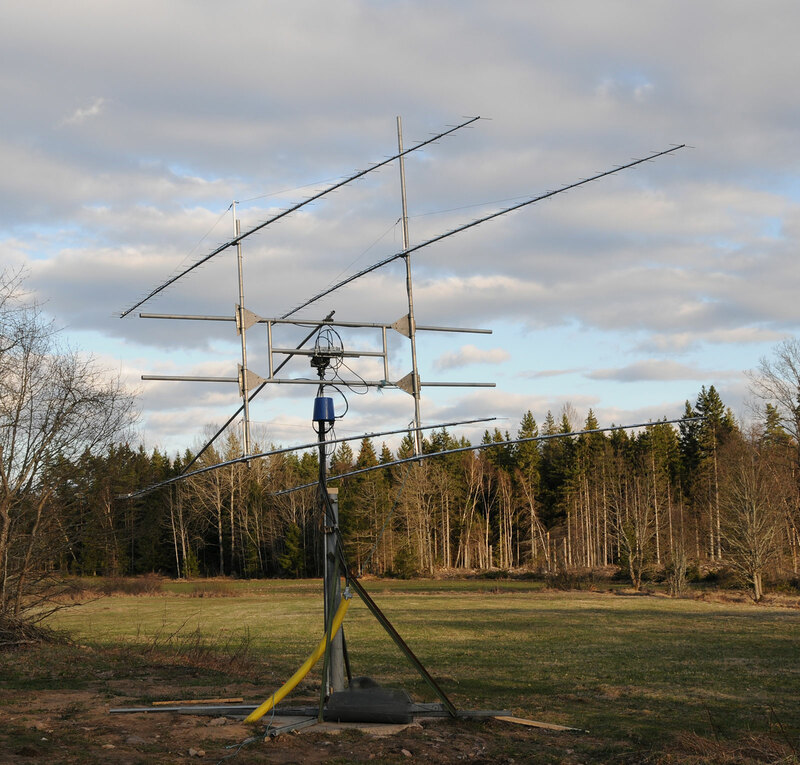 So I aimed for setting up 4 times M2 13WLAs for 70cm. I thought using my TS-2000X and a brick PA would do. Lots of preparation had to be done. 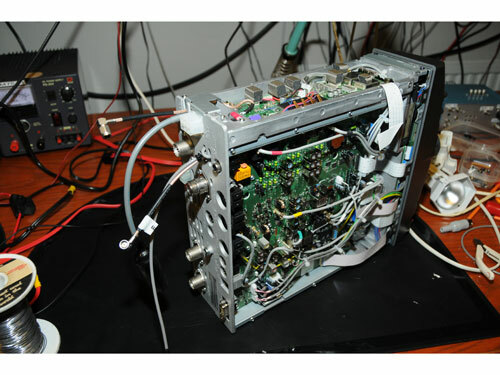 First of all I had to mod my TS-2000X for seperate RX/TX, here is a pic of the rig when the work has been done. Yes I did the mods for 2m and 23cm as well. 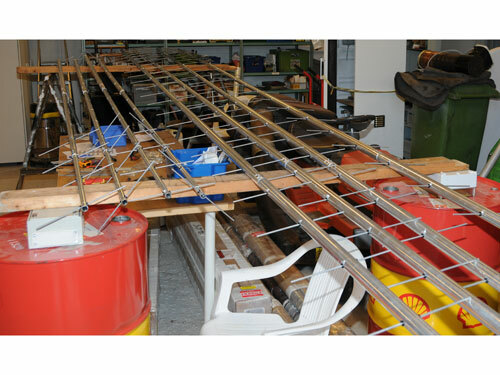 Assembling the antennas indoors, it is a lot easier when having a mechanical workshop to be in. On the floor you can see boxex containing my log period antenna and on the upper right corner is the feed horn for the 23cm dish. And here is a pic of the array being mounted outdoors. When the array was mounted at its final position I’d say I can elevate about 40-deg or something. This is for sure just a temp installation. And inside the shack… well it is a complete mess. 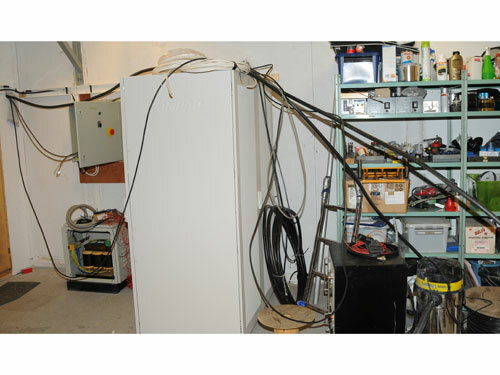 But here is a pic of the shack and another pic of the cabling indoors. TX coax is a 7/8″ and RX coax is Aircom+, old cables which I do not know the condition of. After all this work I was finally able to work the KP4AO for my first ever EME qso on 70cm and my first EME qso since 1999. It felt good. Thanks fo the guys at KP4AO and thanks to SM7XWI for lending me his brick PA.
* Mast mounted preamp, >20dB gain and about 0,3dB NF. 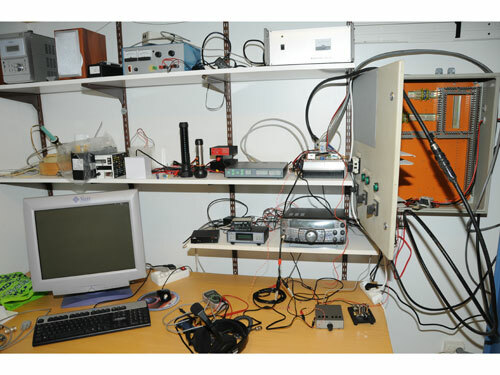 In the pic above you can see the rigs and wavenode on the lower shelf, on top to the right is the 28V supply for the brick PA and the brick PA and the rotator controller is on the middle shelf to the right. At the far right you can see the “soft” 1/2″ coax which is hooked to the 7/8″ TX coax. Keying was done manually, had to short one cable to get +12V to the preamp and RX/TX relay when in RX. When going TX I had to break that connection and ground another cable to get the PA in TX mode. Using the left hand for that and the right hand for the keying. Pretty exhausting after a day with 14 hours of array assembling! I did not have time to run the cables with the network analyzer to check their condition, and I did not have time to sync the rotator indication, so a lot of things where being carried out by a hunch! I will be permanently QRV on 70cm EME in the future, but for now this temp installation will do. Here is how the array looks like when it is completely assembled. The tube in the middle, going backwards is a counterweight needed for the rotator to be able to elevate. I’ve got a GS23B PA going now, and have also heard my own echoes.